Amanda, Alice and I were supposed to go to Ft. Mifflin in NJ for civil war days on Saturday…but it was 95 degrees…so we went with plan B. A tea room! 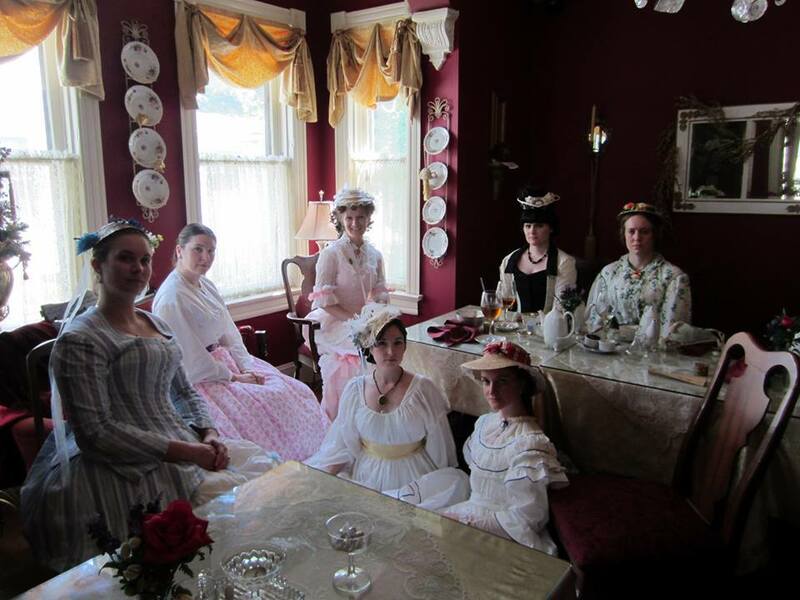 And since the 1860s requirement was lifted several more people joined us for our impromptu tea. I thought there was no way I would finish this dress in time but shockingly I did, without even sewing after work on Friday! I realized in the car halfway there that I never did hem my skirt…oops. But it was for the best as my friend Victoria joined us and she’s much shorter so she needed my round hoop and I wore my elliptical hoop that’s longer. So my gown needed as much length in the front as possible! The bodice is made from swiss dot left over from my chemise a la reine. 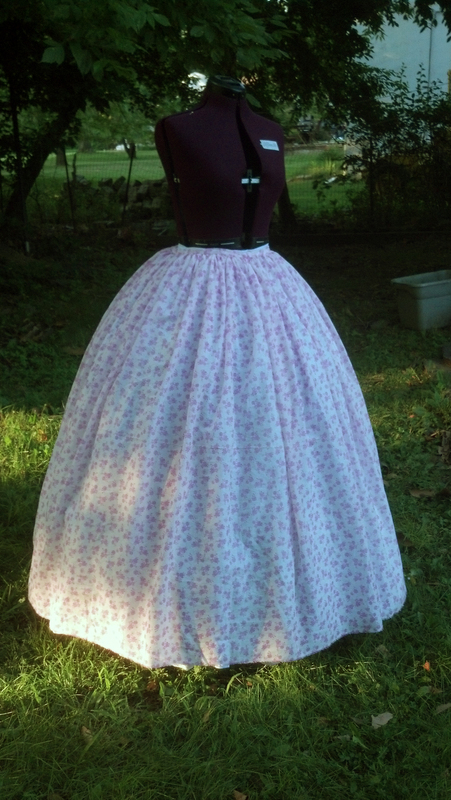 I used the Truly Victorian 440 for the bodice to save time, I gathered instead of darting the sheer layer. I realize in looking at photos that I wish I had made the sleeves much shorter, They’re so long and wide. I also think next time I wear this I’ll add a collar at the neckline, I think it looks more finished that way. But most importantly I started this dress on Monday and wore it on Saturday! Not too shabby. 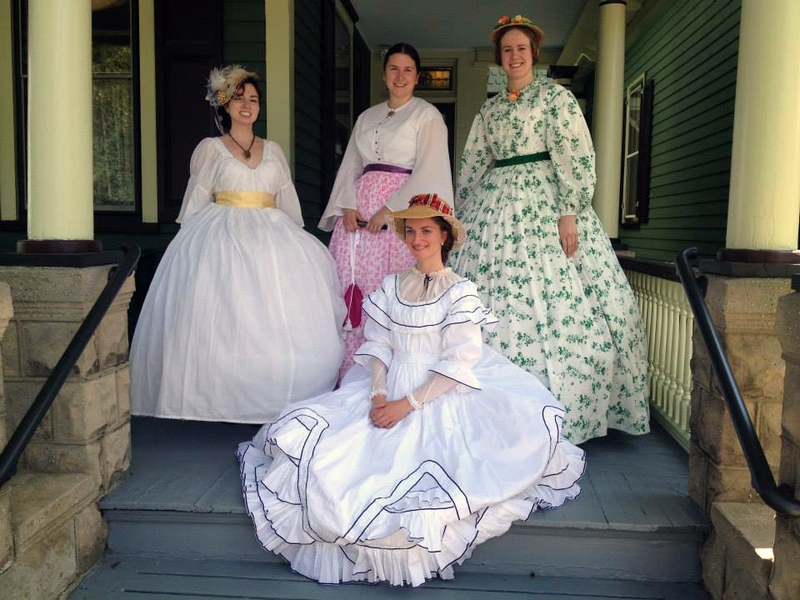 Have you ever wondered what a 208″ petticoat looks like? Step right this way and let me show you! 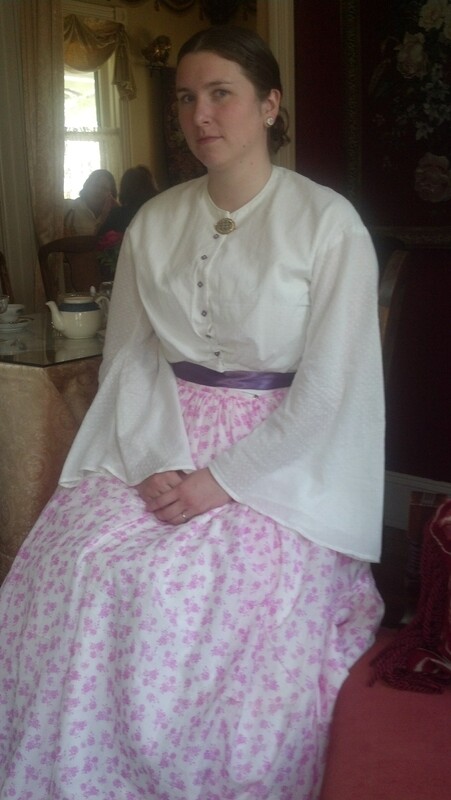 My friends Alice and Amanda have agreed to venture into the 1860s with me. I love a good hoop but up until now no one was willing to run around in hoops with me! So I pretty much have to start from the inside out. I bought the hoop off of ebay ages ago for renaissance things, I had always intended to shrink the top hoop to make it more farthingale shaped, but I never got around to it! Yay for laziness saving the day! I will wear my standard victorian corset as it’s actually pretty short and more suited for early Victorian than the later stuff I usually wear it for. 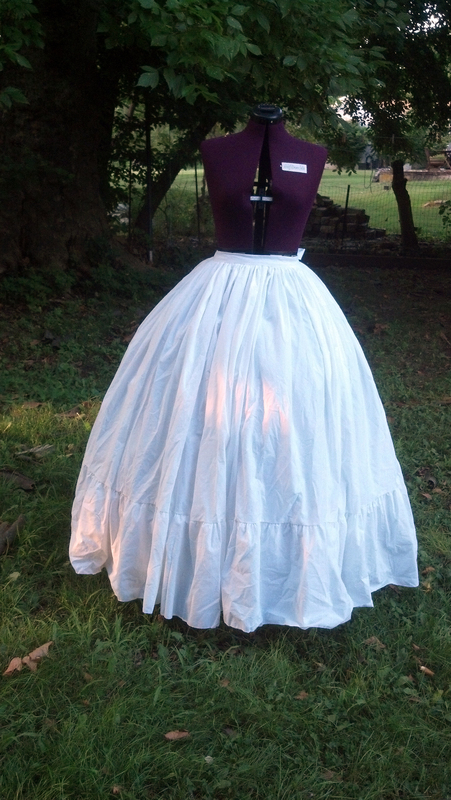 Now why on earth would anyone WANT a 208″ petticoat you say? Good question. Again, laziness. I got a great deal on some 104″ white quilting cotton at Joann‘s. It was supposed to be 108″ and when the company figured it out they had us put it in clearance, plus clearance was half off..and then we realized it had stains on it..so I got it for 75% off of that. 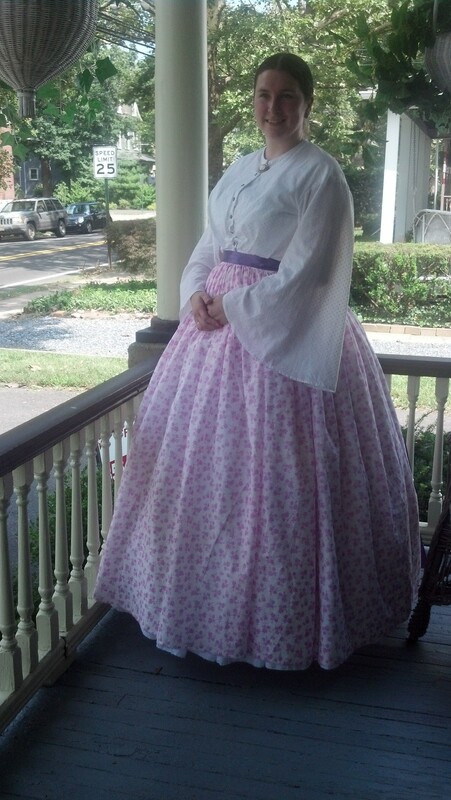 The whole petticoat cost under $5. Now one 104″ panel wasn’t enough, and I really didn’t want to deal with half panels…so 208″ it was! I didn’t use a pattern just ripped it into rectangles that were the right length. For me it worked out to 32″ to the top of the ruffle, then the ruffle is three widths 12″ deep. 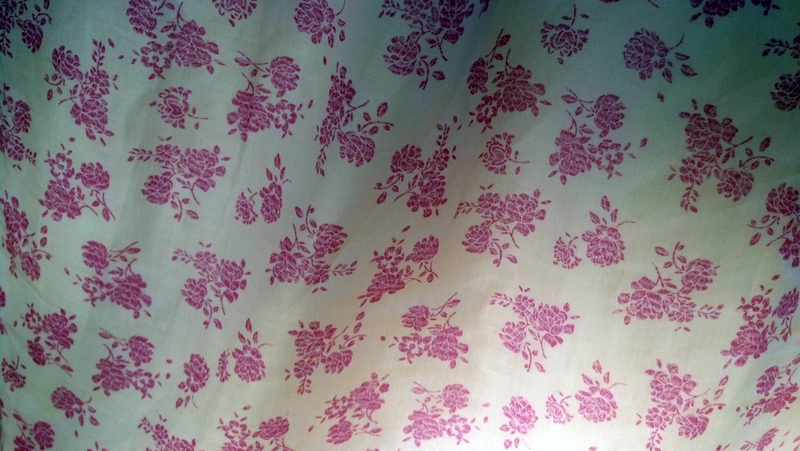 I rolled hemmed them with my serger. Then I used my serger’s magical ruffling foot to attach the ruffle while it gathered it on. In the end I couldn’t gather it all the way down to my 34″ waist measurment so it overlaps by 2″ in the back…I gathered instead of pleating. If I did stacked pleats I could probably fit it more tightly. The skirt isn’t nearly as full. Again, no pattern required. I used the 45″ width of the fabric as my skirt length. Ripped a panel 150″ long and sewed the back seam, gathered the top and added a waistband. Ta da!